Wow! The first week is done already and many exciting sights, sounds, tastes and adventures have been accomplished. Before I start talking about the week and our time spent at Hallym University I want to briefly mention the pre thoughts about the trip many of us had. On our fights over to South Korea we had many thoughts flowing through our minds. What was it going to be like? Will I like the food? Will I get typhoid? Am I going to see Psy? Will North Korea attack? I don’t know anything about Korea! And many, many more. Though on our arrival, even with all these questions, and also MAJOR jet lag, the questions seemed to just disappear, and only the feeling of excitement was flowing through everyone’s heads. That first week we had the privilege to learn some Korean Language at Hallym University with the international program there. On our arrival we were greeted with many signs of welcome to our EMU group. We had many great leaders that helped us that first week; the organizer of our time, Mr. Lee, our teacher, Yang Yun Jung, translator/tour guide, Antonio and Danielle, and our many host families that took care of us that first week. The language course was a 16-hour, one-week class during which our common phrase was, “Korean is easy.” We learned many things that week in class, and it was awesome because even thought it was the start of summer the whole group stayed engaged and excited to learn. With our wonderful teacher Yang Yun Jung we learned the alphabet and how to pronounce words and simple phrases. This being said it was very quick to pick up. I’m not saying we could speak or understand the language at all but the fact that we can sound out and pronounce words (kind of) was a pretty good start. A normal day consisted of us going to school in the morning for four hours, then going on a planned trip by the University to learn the culture of Chuncheon. We did many awesome things like: eat traditional Korean foods, visit Nami Island, go to a temple, danced K-pop with Koreans to PSY, and played traditional Korean drums. The first week was sooooo full but went by too fast. I’m interested and excited to see where the rest of the two weeks will take us but for now, Andrew’s out. One of the best parts of my first week in Chuncheon was without a doubt staying with our host families. Ryan and I got to stay with Suna Won and Chungwon Park and their son Solha. They were so much more than a place to stay or a delicious meal; they were our window to Chuncheon. Through them we could experience the culture without being lost, worried, or confused. Of course each host family was different, and Ryan and mine had different events planned every night. 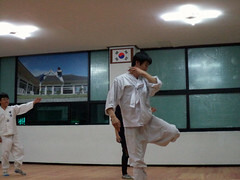 Whether we were going to taekkyeon class (a Korean martial arts/dance similar to taekwondo), playing traditional Korean drums, or just hanging out with the family, they made sure we were never bored. Thanks to our wonderful family we got to experience so many things for the first time. Delicious Korean barbeque called bulgogi was one of my favorites. The host family that I stayed with had never hosted anyone before. Despite their fear that they couldn’t speak English well enough (they could) and that we would be hungry or bored (we never were), I can’t imagine a better host family. They really showed us the hospitality of the Korean culture and shared many experiences with us that I will not forget anytime soon. We were all very sad when we had to say goodbye to our host families on Sunday after church.